Watch water ballet at the Zoo? Well, not exactly, but it might feel like you are watching water ballet when you gaze upon our graceful moon jellies. They’re delicate, translucent, bell-shaped jellyfish that move through the water like elegant water ballerinas. Since a moon jelly’s lifespan is about one year, we recently restocked our Aquatic and Reptile Center exhibit with 30 new, beautiful moon jellies. If you look closely, you’ll see four horseshoe-shaped stomachs on a moon jelly. Our moon jellies feed on baby brine shrimp and if you see them right after they've eaten, their stomachs may have an orange tint from the shrimp. 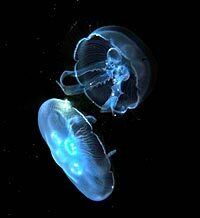 Although moon jellies can unleash a sting, they are not a danger to humans. 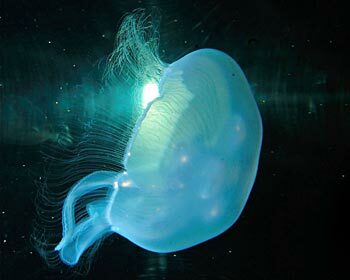 Moon jellies are most abundant in warm and temperate coastal waters worldwide. Visit the Moon Jelly Exhibit and all of our fish, reptiles, invertebrates and amphibians at the Aquatic and Reptile Center, open daily.